Dr. Sherry Ross, M.D. 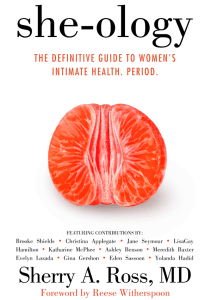 is an award-winning ob/gyn and author of she-ology: The Definitive Guide to Women’s Intimate Health. Period. We’ve gotten together to answer listener questions about women’s reproductive health in a 3-part series of episodes for The Enthusiasm Enthusiast. In the first episode, we answer questions about perimenopause, period fluctuations, menstrual cups, toxic shock syndrome, and so much more. We also talk about how the #metoo movement applies to women’s health. A huge thank you to all the listeners who sent questions and those have agreed to host listening parties. If you’d like to ask Dr. Sherry a question for the upcoming episodes, or if you’d like to RSVP to host a listening party, email: theenthusiasmenthusiast@gmail.com. We’re giving away copies of she-ology to at least 10 listeners who host their friends!